Signed There is 1 product. 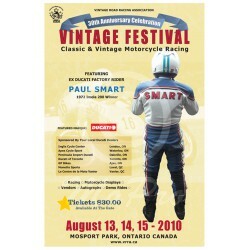 PAUL SMART SIGNED POSTER This poster commemorates the appearance of former Ducati factory rider at the 2010 Vintage Motorcycle Road Racing Association Festival. The poster is signed by Paul Smart. Print Details: Printed on 100lb gloss paper. Size: 304.8mm x 457.2mm (12" x 18"). Unframed and unmatted. Shipped in mailing tube.